It felt like a scene out of Mission Impossible. You enter a cavernous room with over 450 breweries and 2100 different beers. Your job, should you be a fool not to accept it, is to find some of the best beers on the floor in 4 hours or less. In my particular case, I had 3 different sessions (Thursday night, Friday night and Saturday afternoon) to find some of the best beer America has to offer. I was certainly up to the task and couldn't wait to try them out. I made up a quasi attack plan before I entered the Colorado Convention Center. I planned to avoid all of the local breweries from Colorado until the second day so that I could focus on out of state breweries that I couldn't find easily within Colorado. I'll spare you the notes on the average or so-so beers and stick just to the ones I tried that stood out for me. I knew that there would be a few good breweries that would be crowded so I visited one of the most popular breweries first, namely: New Glarus Brewing Company from Wisconsin. The booth for New Glarus was wedged in right next to the center of the festival next to glass walls where seminars were being given. Unfortunately, that meant the line for New Glarus wrapped around next to the wall and left little room for others to pass by. Never the less, I got in line and within 15 minutes I got one of my first samples: their New Glarus Raspberry Tart. This beer was red with a sweet-n-sour aroma. The brew itself was very sweet, almost reminded me of a mead. Not bad. From there on out, I targeted certain brewers I liked with not so long lines. I was after both sour ales and dark beers promarily, but if I saw something that sounded good - I stopped immediately. The following highlights some of the best beers I tried. Were some of these on your favorites list? New Glarus (WI) - Old English Porter sour 1870's style - This one was their best of their litter. Light brown, sour porter with vanilla tones. Nice and tart. Hard to tell its a porter.Light roast. Excellent beer! Bell's Brewing (MI) - Wild One - Funky aroma, golden and clear, nice sour bite to it. Bubble. Very nice. New Holland Brewing (MI) - Night Tripper - I saw this during my recent trip to Michigan but didn't get it til now. Black, roasty, coffee and chocolate overtones. Sneaky heat! Excellent. Deschutes Brewing (OR) - The Abyss - I believe this was the 2008 version. Jet black, dark tan head. Strong roast, chocolate, smooth. As good as I remember. Shorts Brew (MI) - Anniversary Ale 2009 - Made with blood oranges. A wheat wine. Brownish gold, uniquely spiced with slight orange effect. Different and tasty. Jolly Pumpkin (MI) - Biere de Mars - Sours are their specialty. Cloudy and murky goldish brown. Sour funk aroma. Wonderfully sour, crisp and tasty! Hoppin Frog (OH) - B.O.R.I.S. the Crusher Oatmeal Imperial Stout - Ever since trying this at Nick's party a few weeks ago I've sought this one out. Dark, roasty, chocolate and coffee malt flavor. Top 10 impy stout. Stone Brewing (CA) - 09*09*09 Vertical Epic - dark dark tan head, a porter with a slight funk to it. Unique, different and remarkable. Stone Brewing (CA) - 13th Anniversary Ale - Brown, clear, big tan head. Citrus hop nose - oh my! IPA-like. Very good. The Lost Abbey (CA) - Duck Duck Gooze - One of my candidates for best beer of the show. Cloudy yellow. Nice brett funk. Oh ya! Very tart on the finish. Simply an outstanding sour beer. The Lost Abbey (CA) - Red Poppy - I got right back in line for this one. Cloudy brown with yellow edges. Another simply wonderful sour ale. Can only get this in California I believe. Worth seeking out. Russian River (CA) - Consecration - This one was one of my favorites from 2008 and I had to get more of this. Clear reddish brown. Sour nose, tart, crisp and excellent. Please ship this to Colorado! The Bruery (CA)- Black Tuesday Imperial Stout - This was a limited release that opened at 8pm. Long line for this one. Sweet sweet chocolate aroma, velvety chocolate taste. Sweet but Heavenly! Worth the wait. One of the best impy stouts there. Pumphouse Brewery (CO) - Backdraft Imperial Stout 2008 - I had to stop for this one. One of the local breweries. Can't pass up an impy stout. Very dark, sweet chocolate aroma. Roasty, sweet and remarkable. Aged over a year. North by Northwest Brewery (TX) - Barton Kriek - I saw they had a Kriek and couldn't pass this by. Reddish orange. Sour cherry aroma. Sweet and sour taste, slightly tart. Decent Kriek! My sleeper brewery pick. Odell Brewing (CO) - Bourbon Barrel Stout - Poured from a bottle. I missed the tapping party and had to try it. Woody overtones. Very dark. Whiff of alcohol. Bourbon overtones in this dark stout. Very tasty. Worth getting. Odell Brewing (CO) - Woodcut No. 02 Golden Ale - Light gold, clear and bubbly. Slight alcohol hit. Semi-sweet, strong but mellow. Nice oak-aged brew. Alaskan Brewing (AK) - Smoked Porter 2008 - Long line. Smell reminds you of a campfire while cooking smoked salmon. Smoky and rich dark malts. A smoked beer lovers dream. Roasty goodness. Cascade Brewing (OR) - Sang Royal - Cascade brought several beers - all sour. Reddish brown sour brew. Lightly tart with hint of cherries. Nice!! Cascade Brewing (OR) - Cascade Kriek Ale - Red. Tart. Yum. Another winning sour from Oregon. Papago Brewing (AZ) - Orange Blossum - I tried this from a recommendation. Was supposed to remind me of an orange creamsicle. Very different kind of beer. Sweet, floral. Unique, but not what I was expecting. Still, worth trying. Trinity Brewing (CO) - Old Growth Wild Ale - This is another one of my Top Picks for the show. Sour funky aroma. Clear brown. Very VERY tart and sour. Loved it!!! One of the best sours at the show. Terrapin Beer (GA) - Depth Charge Espresso Milk Stout - A collaboration beer with Left Hand Brewing of Colorado. Big coffee and chocolate roast in the aroma. Flavored with lots of coffeee and a sweet milk sugar. Tasty! America's Brewing Co @ Walter Payton's Roundhouse (IL) - Oompa Loompa Chocolate Beer - A golden ale with chocolate. Bright yellow color with a HUGE sweet chocolate aroma. The smell is of a chocolate factory. Light, refreshing with a big chocolate and vanilla taste. Doesn't look like a chocolate beer but tastes wonderful. Jolly Pumpkin (MI) - Oro de Calabaza - another revisit from a 2008 favorite. Light, tart, funky and yellow. I'm a sucker for sours and this one is good. Cigar City (FL) - Bolita Nut Brown Ale - Brown beer that's semi-sweet and with a nutty taste just like it's name. An excellent brown ale with lots of flavor. Cascade Brewing (OR) - Apricot Ale - I made another stop at Cascade and tried this Belgian-style Flanders ale. Cloudy yellow with a big head. Sour! Hint of Apricots. Oh wow! This beer has got to me one of my favorites of the show if not my Top pick. Cascade impressed me 3 times and this one was their best. Troegs Brewery (PA) - Troegs Dead Reckoning Porter - Dark and almost see-through. Light roast. Very easy drinking porter and very smooth. A nice example of a fine porter. Great Divide Brewing (CO) - Yeti Imperial Stout (Cask) - Had to stop and get one of my favorite local impy stouts. Yeti never dissapoints. Silver medal winner this year. Rich, roasty, flavorful. It's well apparent that I'm a dark beer and sour beer fan. My selections were definitely slanted in that direction this year. Fellow attendees: What were your favorite styles and individual beers this year? Let me hear what your top picks were. My only regret was not having enough time to try them all. But you know, after spending an entire night bombarding my palate with so many different beers it was getting really difficult to keep my taste buds from getting overloaded. There's always next year and I'll seek out even better brews in 2010. Still to come, a review of the Denver Rare Beer Tasting at the Wynkoop, a summary of the Flying Dog FBAG party and lots of video from the entire weekend. Stay tuned and come back soon for more 2009 GABF Coverage. 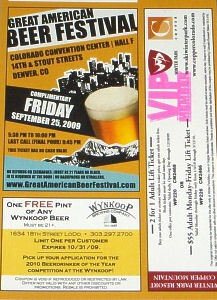 - Colorado top winning state at 2009 GABF.